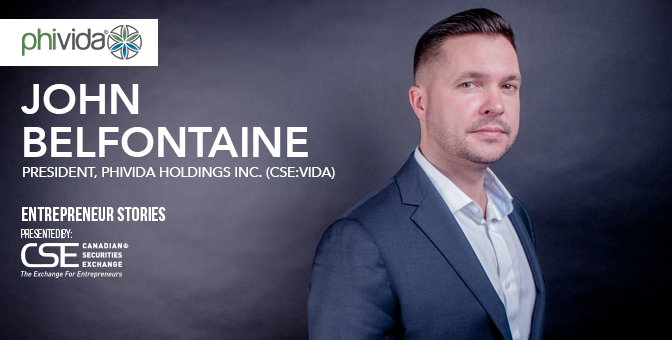 Earlier this year, Peter Murray of Kiyoi Communications, sat down to interview the President of Phivida Holdings Inc. (CSE:VIDA), John Belfontaine, to discuss how the company was launched, what the drivers were behind going public, where Phivida sees opportunities in the cannabis space and more. Scroll down to read the full interview. Peter Murray (PM) Talk to us about the genesis of Phivida. How did you choose your focus with the CBD-infused consumables market still in its infancy? And as you built the company, what measures did you take to establish the right corporate culture? John Belfontaine (JB) We have an interesting origin story. We began as a wholesale company that would broker CBD (cannabidiol) hemp oil from a European supplier to packaged goods companies and fell in love with the idea of creating a whole-plant nutraceutical company, taking our base oils and putting them into packaged goods both for the mass market and the professional clinical market. Our team consists of consumer packaged goods experts, so it was natural to transition to that type of company from the wholesale realm. We then renamed the company Phivida and created a three-division structure. Phivida Organics continues the wholesale, Phivida Nutrition creates functional foods and natural health products that incorporate CBD using a non-encapsulated CBD hemp oil, and Phivida Enhanced is for professional clinical grade products. As we built the company, we wanted to never lose the spirit of health and wellness – our slogan is Health and Wellness and Harmony. We have a philosophy of goodwill and benevolence and want to maintain and never lose our original intention, which is to help patients. We are a company of doctors, a company of functional food and natural health product specialists, and nutritionists. We want to always keep the focus of Phivida’s direction on bettering the lives of our patients and giving practitioners the tools they need to give their patients a product which will help in their everyday lives. As a result, we developed a platform called Phivida Families which focuses on education, research and sponsorship. It underpins our education efforts and marketing for all products. Every single one of our executives and operational personnel and partners subscribes to that goodwill community-based spirit. As an example, we launched a subsidy program where families with children under 18 or parents over 65 with a diagnosed disorder can receive free product if they share their experience with us. And a key reason we were able to assemble such a strong team is that we all have a story where cannabinoids have helped a loved one. This affects us personally and makes it more than an individual pursuit – it’s a crusade. And really being part of a paradigm shift, a shift away from pharmacology and back to our roots of traditional plant medicine. Nothing heals like Mother Nature. (PM) Tell us about your products and how you differentiate them and the brand now and into the future as the momentum of legalization draws new players into the hemp/cannabis marketplace. (JB) Phivida has a strategic portfolio of full-spectrum CBD hemp oil extract-based products. Phivida’s nutrition line focuses on preventative health, using functional foods and natural health products as a vehicle to prevent hospitalization and reduce chronic inflammation for everyday consumers and active individuals. Phivida Enhanced, on the other hand, creates clinical grade products for professional practitioners. In terms of our key differentiators, the first is quality standards. We have dedicated ourselves to GMP (Good Manufacturing Practices). All of our products are quality and safety tested, both at the batch level and finished stage. All ingredients are premium, certified organic ingredients. We try to adhere to a no-sugar-added approach, and if there is packaging better than what we are using we will adopt it. So, we are looking to develop a product that is the most professional, premium quality product in the industry – the global golden benchmark for quality standards. Ours is still a cottage industry and not all manufacturers hold themselves to the high standards we are used to. We apply Health Canada-based standards to a US-operated company with no real regulation. So, the quality assurance is where we set ourselves apart. Beyond that we use a special technology with our products called encapsulation. We use both micro and nano-encapsulation. Encapsulation simply means that cannabinoids, which we derive from hemp, are lipid-based – they are a fat. And fats are not soluble in water, but when you encapsulate these molecules on a nano-molecular level, we create a polymer shell around each molecule and it protects that it as it is ingested orally, into your gastro intestinal tract. The benefit is that the product becomes soluble, so we can put it into a functional beverage format which creates ease of use and a more enjoyable delivery method. But more importantly, encapsulated cannabinoids are faster acting and longer lasting. They bypass first-pass metabolism and have a higher uptake into the bloodstream. They penetrate the blood-brain barrier at a rate up to 600% higher than normal. So, you receive five to six times the medicine for the same price at a higher quality standard. That is the Phivida promise – that we give you more medicine, more value, and the highest quality products in the marketplace. (PM) Tell us about a few products in detail. (JB) In the consumer line we have created a holistic mind-body-soul line of CBD-infused vitamin juices, and these target certain conditions – from cognition to the immune system to moods. Phivida Protect is an immunity booster that has a high level of antioxidant and anti-inflammatories. Phivida Relax brings down anxiety and induces healthy sleep. That would be the most popular in terms of where our distributors are demanding product for consumers. And the products are all vegan-based. On the clinical side, our hard cap pills have a special blend for muscle, bone and joint placement. We put cannabidiol in with MSM chondroitin and glucosamine to repair and rebuild muscle tissues, which is ideal for patients with osteoporosis or those going into a later stage of their life with deterioration from chronic inflammation. Those are our two flagship products at this point. But we are really focused on innovation and building our portfolio of SKUs. We are at about 30 now and see product innovation as a key component of our long-term growth. (PM) Discuss your experience dealing with investors in a private setting, and then during your effort to go public. (JB) We are extremely fortunate to have a strong, sophisticated and well-connected shareholder base. Our shareholders are the who’s who of the cannabis industry. Our go-public round could not have gone better. We facilitated the go-public strategy through a long-form prospectus offering, which is not the fastest or easiest way to go public. But we feel the hard way is sometimes the right way. You save dilution by not doing a reverse takeover with an existing public vehicle. And we were beholden to a higher level of disclosure, which we welcome because we know we have done our homework, we have a strong business plan, a strong team, and our business model is contrarian to the typical cannabis story you see. We owe a lot to our investment bankers. We were led by Canaccord Genuity in a syndicated offering with Mackie Research and Haywood Securities, and they did an excellent job of stewarding our story into the retail marketplace. But we also owe a lot to our key strategic advisors, John Di Girolamo at Liberty North Capital, as well as Donato Sferra and Mark Attanasio, principals of Hillcrest Merchant Partners, who were responsible for leading us through the capital markets strategy and navigating us through proper transaction structuring. (PM) You opted for the Initial Public Offering route to go public. What business objectives did you hope to achieve by listing on a securities exchange? (JB) We debated internally whether to stay private or look to access the capital markets through a public transaction. We decided at the end of the day that the needs of the shareholders are paramount. We were able to structure a transaction that would be beneficial and minimize equity dilution in the company. That would add value for shareholders, and from a business perspective that is the primary concern. We chose the go-public route to capitalize the company with a minimum of dilution, and we were fortunate to open our IPO at an ideal time. We opened it days after the World Anti-Doping Agency (WADA) removed CBD from schedule, allowing it to be used by athletes for the first time in the history of competitive sports. And shortly after, the World Health Organization (WHO) released a report that said CBDs were not only safe and nontoxic and non-psychoactive, but in fact medicinal. We received so much interest from the institutional investment community that we had 300% to 400% more demand than we were able to take. We closed the IPO in a matter of days with gross proceeds of $5.75 million. (PM) In selecting a marketplace to list the company, what stood out about the CSE? What was your experience during the application process, and how have your first few weeks on the exchange been? (JB) There was only one option for us to list, and that was the CSE. The Canadian Securities Exchange really caters to the entrepreneur, and that is the spirit of what Phivida is. The CSE values innovation. We are a biotech/food and drug company that is about nurturing new ideas and developing new markets based on innovation and product development and concept development, so the CSE was the perfect platform for us. Our experience listing on the CSE was seamless. From the service level through the application process through assisting in understanding filing and regulatory requirements. And immediate response. When we began trading it was, I understand, the highest volume trading day in the history of the exchange. Even so, their service was uninterrupted – it was the utmost professionalism and we were extremely impressed and satisfied with the experience and highly recommend it to other private companies. (PM) The stock market has been reacting well to hemp stories for a couple of years now, but you took your time and built the company privately before making the move to go public. Talk to us about that strategy. What advice would you have for companies considering a public listing? (JB) I believe the timing we chose to launch our IPO was ideal. Had we considered opening our IPO this time last year I don’t think the markets were as strong. As we enter 2018 you see major market catalysts. We saw the WADA announcement. We saw the WHO put out their positive report. We also saw Constellation Brands purchase 9.9% of Canopy Growth, the largest cannabis company in the world, to get into the cannabinoid-infused functional beverage market, which we’d been operating in and developing for several years. So that validated our business model. And I feel the timing was ideal in terms of how we launched and stewarded and properly educated the marketplace on the offering. (PM) Talk about the team you assembled around the company to prepare for going public. (JB) That was plenty of discussion as to whether we wanted to take on a public listing or keep the company private. But we were fortunate in the sense that we were able to build a public company support team we felt comfortable could navigate the requirements and do a public offering. First and foremost, our back office and bringing on Carmelo Marelli and DSA who were our corporate secretary. Our legal counsel, by adding Peter Simeon, a partner at law firm Gowlings WLG, to the board gave us strong legal counsel and a national presence at one of the largest law firms in the country, specialized in publicly traded companies. And on business advisory, adding Bill Ciprick, Senior Vice President of Business Development at the Business Development Bank of Canada. He is another component of good corporate governance, which is critical to the development of a young public company. Good governance, we think, is lacking in the Canadian capital marketplace and we really encourage that approach. And in terms of having leadership on consumer packaged goods, adding Jim Bailey, former President of Red Bull Canada, to our board gave us strength and vision on how to develop a functional beverage product. He understands that we are not an adrenaline-based function but a health and wellness function, yet the same model fits. And on top of this, we have a tremendously strong clinical scientific team plus, again, a team of directors who have done it before in terms of building both natural health product-based consumer packaged goods offerings as well as food and beverage. (PM) Looking at the industry landscape, how big can your sector get and where are the best opportunities? What must participants be aware of from a legal perspective? Are there challenges to selling product in the United States? (JB) Phivida has the opportunity to expand globally, and we anticipate being a globally recognized brand and setting the gold standard in CBD hemp oil-infused products in coming years. We’ve already signed agreements into Asia, expanding our reach into the Japanese market, which is one of the largest nutraceutical-buying markets in the world. We will continue to pursue new opportunities and markets in North America, Europe, South America, and Asia. In fact, in the first two weeks of 2018 we have announced a licensing deal in Oregon that opens access to an additional 500 locations for us, and a Global Digital Reseller-Supply Agreement that expands our online reach into Germany and Australia. And those come on top of the Japan agreement I just mentioned, which we announced January 5. In the United States, we are excited to be covered by section 7606 of the Federal Farm Bill. We source our product through farms that receive permits from the state-level departments of agriculture. We are a federally compliant product which gives us an advantage to be sold as a functional food. This is unique in the cannabis/hemp space and should be recognized and celebrated. We recognize and support medical cannabis companies, but we are THC-free – all the medicine, none of the side effects. And because we focused on hemp-derived full-spectrum oils, it gives us the opportunity to penetrate mainstream markets such as grocery stores and naturopathic clinics. (PM) What makes Phivida attractive for investors at its current market value and stage of corporate development? (JB) Phivida is in a rapid growth phase in its corporate development life cycle. This is a very interesting time for investors to hear the story. Our comparables in the marketplace have huge valuation multiples compared to where we are. When we were at a pre-money valuation we were around $10 million market capitalization at the IPO level, and our closest comparable, Isodiol, was at $450 or $500 million market capitalization. So, we were very undervalued compared to our closest comparable. We are a growing company with huge potential for acquisitions of new technologies as well as capturing leading share in new markets. California, Washington, Oregon, Colorado – across the western United States is our foothold, but we have new partnerships globally and we continue to pursue development of globally distributed brands. As a result, this is a great time for investors to look at a rapid growth company which is well managed with premium quality products that is extremely well structured – fewer than 45 million shares outstanding with almost $8 million cash and no debt. Management, offering, structure and financial health – we stack up well.